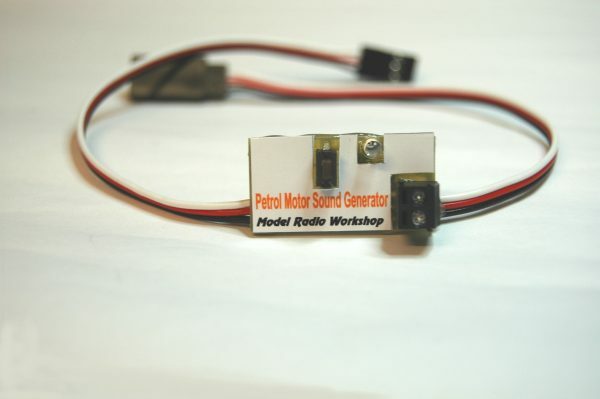 The boat Sound Generator comes in 3 forms Petrol, Diesel and Steam. They all can be set to simulate different numbers of cylinders, this can be selected by the end user. The unit just plugs in the line of the model boats speed controller and will follow the motors speed with engine sounds to simulate a full size engine. Please state which version you require when ordering. Note a power amplifier maybe required in some models. Setting up is straight forward, with your receiver turn off and your transmitter on, hold the setup button down switch on your receiver while still holding the button down, you will hear a beep from the loudspeaker, as soon as this happens let go of the button. The unit will now go thorough all of the 5 different cylinder combinations, when it plays the one you like push and hold the button once more while it is still playing the sound you like and a second beep will sound to tell you that it has lock that sound. When you first switch on the your radio the sound generator will not make a sound until you move the throttle stick, the L.E.D will flash until you have move the stick. Once you have moved the stick the L.E.D will come on when ever the throttle stick is at neutral, if the L.E.D does not come on at neutral you will have to move your trim on your throttle channel and may have to make adjustments your speed controller to reset its neutral.